Misfire is a common driveability problem that may or may not be easy to diagnose, depending on the cause. A misfiring cylinder in a four-cylinder engine is, pardon the pun, hard to miss. The loss of 25% of the engine's power output is the equivalent of a horse trying to run on three legs. The engine may shake so badly at idle that it causes vibrations that can be felt in the steering wheel and throughout the vehicle. The engine also may be hard to start and may even stall at idle, depending on the accessory load (air conditioning, headlights and electric rear defroster, for example). When misfire occurs, performance suffers along with fuel economy, emissions and idle quality. And, when a misfiring vehicle is subjected to an emissions test, it will usually fail because of the unusually high levels of hydrocarbons (HC) in the exhaust. The Onboard Diagnostic (OBD II) system on 1996 and newer vehicles monitors misfires and will set a Diagnostic Trouble Code (DTC) if the misfire rate exceeds a certain value that may cause emissions to increase. In cases of severe misfire, the Check Engine light may illuminate or flash while the engine is misfiring. The codes can be read by plugging a scan tool into your vehicle's diagnostic connector located under the dash near the steering column. What causes a cylinder to misfire? Basically, it's one of three things: loss of spark; the air/fuel mixture is too far out of balance to ignite; or loss of compression. Loss of spark includes anything that prevents coil voltage from jumping the electrode gap at the end of the spark plug. Causes include worn, fouled or damaged spark plugs, bad spark plug wires or even a cracked distributor cap. A weak coil or excessive rotor gas inside a distributor would affect all cylinders, not just a single cylinder. 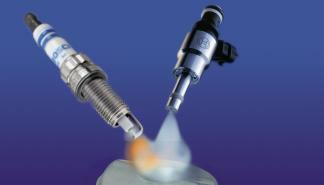 Spark plug fouling is a common cause of ignition-related misfires. "Lean misfire" can occur when the air/fuel mixture is too lean (not enough gasoline in the mixture) to burn. This can be caused by a dirty, clogged or inoperative fuel injector; air leaks; or low fuel pressure because of a weak pump, restricted filter or leaky pressure regulator. Low fuel pressure would affect all cylinders rather than an individual cylinder, as would most air leaks. A leaky EGR valve can also have the same effect as an air leak. In fact, if a vehicle has one or more misfire codes and a P0401 EGR code, the fault is likely carbon buildup under the EGR valve. Loss of compression means the cylinder loses most of its air/fuel mixture before it can be ignited. The most likely causes here are a leaky (burned) exhaust valve or a blown head gasket. If two adjacent cylinders are misfiring, it's likely the head gasket between them has failed. Also, if an engine is overheating or losing coolant, it's likely the head gasket is the culprit. Intermittent misfires are the worst kind to diagnose because the misfire comes and goes depending on engine load or operating conditions. They seem to occur for no apparent reason. The engine may only misfire and run rough when cold but then smooth out as it warms up. Or, it may start and idle fine but then misfire or hesitate when it comes under load. Also, it may run fine most of the time but suddenly misfire or cut out for no apparent reason. Engine misfire can be felt at idle as a shaking or vibration. At higher engine speeds, the engine may cutout, stumble or lose power. If you find one or more misfire codes when you check for fault codes with a scan tool, the codes by themselves do NOT tell you WHY the cylinder is misfiring. It could be ignition, compression or fuel related. However, if you find a P0304 misfire code for cylinder number 4, and also a P0204 code (P0200 series codes cover the injectors), you'd know the misfire was probably caused by a bad injector. If there are any EGR codes (P0401 for example), the misfire could be due to carbon buildup under the EGR valve. If there is a lean code (P0171 or P0174), the problem could be a dirty fuel injector. If there are no other codes except for the misfire code, check the ignition components for that cylinder. The cause could be a badly worn or fouled spark plug, a bad plug wire, carbon tracking or moisture inside the boot of a coil-on-plug ignition coil, or a weak or defective coil in a multi-coil distributorless ignition system. If you find a P0300 random misfire code, it means the misfire is random and is moving around from cylinder to cylinder. The cause here would likely be something that upsets the engine's air/fuel mixture, such as a major vacuum leak, a leaky EGR valve or unusually low fuel pressure (weak pump or faulty pressure regulator). If your engine seems to be misfiring, but there are NO codes set (no individual cylinder misfire codes or no random misfire code), and you have a professional grade scan tool that can access Mode $06 data, you can use the scan tool to look at the raw misfire data that is being tabulated for each cylinder. Normally the misfire counts should be zero or close to zero for every cylinder. The OBD II system will usually NOT set a misfire code until the actual misfire count exceeds about two percent for any given cylinder. So by looking at the actual Mode $06 misfire data, you should be able to see any cylinders that are showing an abnormally high misfire rate. For example, if the Mode $06 scan tool data shows zero or close to zero misfires for all cylinders except cylinder number four (which has a count of say 80 or higher), that would tell you cylinder number four has an ignition, fuel or compression problem that will require further diagnosis. In the case of a steady misfire, isolating the misfiring cylinder is the first step in diagnosing the problem. The old-fashioned method for finding a weak cylinder is to temporarily disconnect each of the spark plug wires, one at a time, while the engine is idling. When there's no change in the idle speed, then you have pinpointed the weak cylinder. A power balance test will tell you the same thing, but this requires some hookups and an engine analyzer. A power balance test is preferable to pulling plug wires, because it keeps you away from the voltage and prevents the voltage from causing any damage to the electronics in the ignition system. When a plug wire is physically disconnected from a spark plug, the high voltage surge from the coil cannot follow its normal path to ground through the plug wire and spark plug, so it passes back through the coil. Most ignition systems are robust enough to withstand such voltage backups intermittently but not on a prolonged basis. If the coil or ignition module is already weak, it may push the component over the brink causing it to fail. A weak cylinder will stick out like a sore thumb on an ignition scope or a digital storage oscilloscope (DSO). The secondary parade pattern will reveal the firing voltages for each cylinder. The number one cylinder will be the first one on the display, followed by each of the other cylinders in their respective firing order, moving across the screen from left to right. If the peak firing voltage for any cylinder is significantly higher or lower than the others, it indicates a problem. An usually low firing voltage would tell you the spark is finding a shortcut to ground. A fouled, shorted or cracked spark plug; arcing past the spark plug boot to ground; and a shorted plug wire would be the most likely causes. An unusually high firing voltage in a cylinder would tell you the spark plug electrode is too wide or too badly worn or that the plug wire is open. If the firing voltages for all the cylinders are about equal with the engine idling, a snap-kV test will help you find a misfire that occurs when the engine is under load. To conduct this test, suddenly open the throttle wide and then let it fall back while observing the firing pattern on the scope. All the firing voltages should increase during the snap-kV acceleration test, but, if any individual cylinder increases significantly more or less than its companions, it indicates trouble. A snap-kV voltage spike that is taller than the rest indicates high resistance in the ignition secondary to the affected cylinder. Check for excessive resistance or an open in the plug wire. A spike that is much shorter than the rest indicates loss of voltage. Check for a shorted, cracked or damaged spark plug, arcing across the spark plug boot or a shorted plug wire. Misfire under load accompanied by low overall spike heights during the snap-kV test would tell you the available voltage from the coil is low. The most likely cause, in this case, would be a faulty ignition coil. But low battery voltage might also be a factor, too. Be sure to check the battery and charging voltage. The next thing you should look at is the primary pattern for the suspicious cylinder. The primary pattern can reveal additional pieces in the diagnostic puzzle. The primary pattern will show when the coil starts to charge, the peak or "arc-over" firing voltage (which you've already looked at and determined was higher or lower than normal), the "spark burn line" and coil oscillations. The spark burn line is the part of the waveform that immediately follows the firing voltage spike. The height of this line can tell you if the air/fuel mixture is running rich or lean. If the fuel mixture is lean, then the spark burn line will be higher than normal. If the air/fuel mixture is rich, then the spark burn line will be lower than normal. A lean mixture in a single cylinder can be caused by a leaky intake manifold gasket, air leakage past injector O-rings, a leaky EGR valve (if the valve is adjacent to the cylinder intake port) or a dirty, plugged or inoperative fuel injector. Loss of compression because of a leaky (burned) exhaust valve or a leaky head gasket can also affect the spark burn line in the same way. Note: If the spark burn lines for all the cylinders are higher than normal (indicating a lean fuel mixture), the underlying cause would be something that affects all cylinders such as an intake manifold vacuum leak, leaky vacuum hose, leaky EGR valve, leaky throttle gasket or low fuel pressure (weak fuel pump or bad pressure regulator). A rich fuel mixture in an individual cylinder is less common but can occur if the fuel injector leaks. A more common condition would be a rich condition in all cylinders caused by a dead oxygen sensor or coolant sensor that prevents the computer from going into closed loop, or by a faulty fuel pressure regulator that feeds too much pressure to the injectors. Something else to look at in the spark burn line is the amount of "hash" it contains. A good cylinder will show a relatively clean line with little hash. A lot of hash, on the other hand, occurs when ignition misfire or lean misfire are present. The duration or length of the spark burn line can provide more clues about what's going on inside the cylinder. If the duration of the burn line is longer than about 2 milliseconds, the air/fuel mixture is running abnormally rich for any of the reasons just given. If the burn line is shorter than about 0/75 milliseconds, then the cylinder is running too lean. The last thing you want to look at in the primary ignition pattern is coil oscillations. If the coil is good, there should be at least two and preferably three or more oscillations after the burn line. Fewer oscillations would indicate a faulty coil. 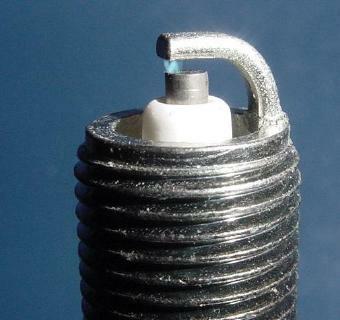 If you have a misfire and have isolated it to one cylinder, the cause will be obvious when you remove the spark plug. If the plug's insulator is cracked or broken, you've found the problem. If the plug appears to be OK but is wet, inspect the plug wire and boots for damage. Measure the plug wire's resistance, end to end, with an ohmmeter. Refer to the vehicle manufacturer's specifications, but, as a rule, resistance should not exceed 8,000 ohms per foot. Replace the wire if resistance exceeds specifications. If the plug is fouled, you've found the source of the misfire, but you still have to determine what caused the plug to foul. Heavy black oily carbon deposits would tell you that the engine is burning oil. The most likely cause is worn valve guide seals and/or guides, but worn rings and cylinders can also allow oil to enter the combustion chamber. Replacing the spark plug will temporarily cure your customer's misfire problem, but, until the oil consumption problem is fixed, the engine will continue to foul plugs. A leakdown test or compression test will help you determine if the oil is getting past the valve guides or the rings. If the cylinder shows little leakdown or holds good compression when a little oil is squirted into the cylinder (wet compression test), it would tell you that the engine needs new valve guide seals and/or guide work. Most late model engines have positive valve guide seals. Often, the guides are fine, but the seals are worn or cracked. The seals can be replaced on some engines without too much effort and without having to remove the head. Just pull off the valve cover, remove the valvetrain hardware and use an external spring compressor to remove the springs so new seals can be installed. A regulated air hose connected to the spark plug hole will keep the valve from dropping into the cylinder. But, on many OHC engines, there's so much disassembly involved to get to the valve springs you may have to remove the head. A spark plug that shows heavy whitish to brown deposits may indicate a coolant leak either past the head gasket or through a crack in the combustion chamber. This type of problem will only get worse and may soon lead to even greater problems if the leak isn't fixed. Coolant makes a lousy lubricant and can cause ring, cylinder and bearing damage if it gets into a cylinder or the crankcase. Loss of coolant can also lead to overheating, which may result in cracking or warping of aluminum cylinder heads. If you suspect this kind of problem, pressure test the cooling system to check for internal coolant leakage. Spark plugs that show preignition or detonation damage may indicate a need to check timing, the operation of the cooling system and conditions that cause a lean air/fuel mixture. You might also want to switch to a colder heat range plug. Short trip stop-and-go driving can cause a rapid buildup of normal deposits on plugs, especially if the engine has a lot of miles and there has been some oil leakage past the valve guide seals and rings. The cure here might be to switch to a one-step hotter spark plug. If the spark plug and plug wire are OK but the cylinder is weak, a leakdown or compression test should be done to determine if the problem is compression related. The exhaust valves are the ones most likely to lose their seal and leak compression, so, if you find unusually low compression, follow up with a wet compression test to determine if the problem lies with the valves or rings. No change in compression with a wet test would tell you the problem is valve related (probably a bad exhaust valve) or a blown head gasket. But, if the compression readings are significantly higher with a wet compression test, it would tell you the piston rings and/or cylinder walls are worn. Either way, your customer is looking at major repairs. The only cure for a leaky valve is a valve job, and the only cure for a leaky head gasket is to replace the gasket. Likewise, the only cure for worn rings and cylinders is to overhaul or replace the engine. Low compression can also be caused by a rounded cam lobe. If the valve doesn't open, the cylinder can't breathe normally and compression will be low. A visual inspection of the valvetrain and cam will be necessary if you suspect this kind of problem. A dirty fuel injector or fouled spark plug can cause misfires. If the ignition components and compression in a misfiring cylinder are fine, that leaves a fuel related problem as the only other possibility. You can start by checking for voltage at the injector. A good injector should also buzz while the engine is running. No buzzing would tell you the injector is dead, while a no-voltage reading would tell you it isn't the injector's fault but a wiring or computer driver problem. If the injector is buzzing and spraying fuel but the cylinder isn't getting enough fuel, the injector is dirty or clogged. On-car cleaning may help remove the varnish deposits that are restricting the injector and restricting fuel delivery, but chances are, if the injector is clogged enough to cause a steady misfire, it will have to be removed for off-car cleaning or be replaced. You can also observe injector performance on a scope, and check its response to changes in the air/fuel mixture. First of all, a flat line would tell you the injector is dead or is not receiving voltage (depending on where the line falls on the screen). If the injector is working, the line should drop when the injector turns on, then peak when the current is switched off. The injector scope pattern will tell you how long the injector is on. If you make the air/fuel mixture artificially lean by momentarily pulling off a vacuum hose, and/or artificially rich by feeding some propane into the manifold, you should see a corresponding change in the injector on time as the computer responds to input from the oxygen sensor. No change would tell you either the O2 sensor is dead or there's a problem in the computer. One thing that should always be checked if an injector is removed for cleaning and/or testing is its spray pattern. A good injector should produce a cone-shaped mist of fuel vapor. If you see solid streamers in the spray pattern or a solid stream of fuel, the injector needs attention. If off-car cleaning fails to restore the normal spray pattern, the injector must be replaced. If you're dealing with a random misfire that can't be isolated to a particular cylinder, all the injectors may be dirty. You should also check fuel pressure to see if the pump is weak or the pressure regulator is defective. A plugged fuel filter can reduce fuel pressure. If fuel pressure is within specifications, check the intake vacuum to see if there is an air leak that's upsetting the overall air/fuel mixture. A couple of overlooked causes here may be a leaky EGR valve or a leaky power brake booster.